This fall Color Club is releasing two collections for the benefit of charity. The first set, Pride: Live Your Life benefits New York-based AIDS charities and the second set, In The Teal, benefits the Ovarian Cancer Research Fund, with 10% of the proceeds being donated to OCRF. "New York, NY – July 2011 - What makes us proud: Being bold. Making a statement. Living life to the fullest. Equality for all. From New York-based Color Club, the new PRIDE Collection- vibrant polishes in every color of the rainbow, from red to violet—captures what it means to live your life in color and express your true self (or just your mood du jour). Seven formaldehyde, toluene, DBP, and paraben-free shades celebrate equality with cheeky names like “Not Just for Kelly, Green” and “Boys Wear Blue,” while a portion of proceeds from the sale of the collection benefit New York-based AIDS-related charities. Life comes in all shapes, sizes, colors, and preferences. At the very least, shouldn’t your nail polish?" Note: The Pride collection shades are all existing colors with the exception of Not Just For Kelly Green, which is exclusive to this set. Also, how cute are the rainbow wrappers on the handles? P Is For Pride. Medium blue-based red creme. Polish For All. Neon orange creme. Dress For The Parade. Bright yellow creme. Not Just For Kelly Green. This is a new shade exclusive to this set and it's a medium yellow-toned grassy green. Makes me think of shamrocks. Boys Wear Blue. Bright, borderline neon blue creme. Express Yourself. I don't know which Color Club shade this matches up to This looks to be a Color Club shade called Disco Dress (which I've never seen before today), but if you have Massini/Studio M Grape Escape, it's the same color. There's also a Funky Fingers in this shade called Riot (thanks for reminding me of the name, Em!). This is the purple creme. Like... The purple creme to end all purple cremes. I have nothing like it in my collection and if you are a purple creme fan at all, you should seriously consider checking this one out. In fact, everyone should see this color for themselves. It's MAGICAL. The Pride: Live Your Life In Color collection is currently only available on Color Club's website (at an unexpectedly steep $48) and includes a bottle of 0-60 Speed Dry Topcoat; I'm uncertain on if/when the collection will show up at other retailers. The exact charity and the amount of the donation is not specified. Sorry! "New York, NY – July 2011 Color Club, a New York based cosmetic brand specializing in nail and lip products announced today a limited edition nail polish collection developed exclusively for the Ovarian Cancer Research Fund (OCRF). The new shades – OCRF and Super Saturday Teal – are sophisticated yet playful teal blue shades created exclusively for OCRF and Super Saturday 14. The polishes will be available beginning in July 2011 as part of the OCRF Super Saturday 14 event and sold though September 2011, which is Ovarian Cancer Research month. The polishes are available on www.shopcolorclub.com and 10% of all proceeds will benefit OCRF. 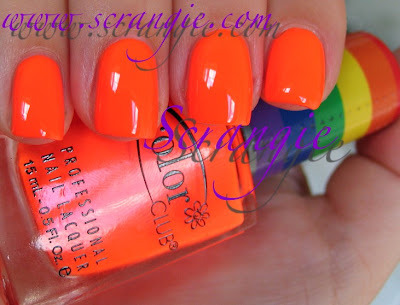 Color Club is also the official nail sponsor of Super Saturday 14 and will be offering manicures and nail art at the event on July 30, 2011 in the Hamptons." As noted above, 10% of the proceeds will be donated to the Ovarian Cancer Research Fund. I really love the teal collection! That last purple is gorgeous too. I love them ALL! Especially Not Just for Kelly Green and OCRF Teal. Gorgeous! I wish the Pride collection weren't mostly repromotes, but that said I love the vivid colors! Ooooh...that purple is to die for! I'm always looking for a colour like that! Great colors!! I love them!!!!! I love the teal set (for once buying polishes contributes to a good cause, besides making me feel better)! These are really nice collections. I will be buying them both. So glad to finally see the swatches of this collection that had only seen the bottle shots of before. Liking P (red) a lot and the Ovarian set looks much better on than it did in the bottle shots I saw before. Gaah I so want the rainbow bottles! When I've first seen this collection online, I thought I just need to have it.... Unfortunately it is available only online and a little pricey (which is ok in this case since part of the money will be donated). I might order it soon now that I have seen your swatches! i wonder if the pride polishes will be available separately or if you have to buy the whole set? AWESOME!, Eventhough these colors are old, still love to see them on your nails! Wonderful - I was just thinking "I need a nice creme true green and yellow," and tada :)! I could get similar colors cheaper from Jordana or something, but I'm happy to buy the set instead and have some of the money go to research, too. I wonder when these release!? I can't wait! Where are these for sale? Anyone know? I was out of the loop late last year, but I'd love to try these great colors for a cause!